Fractions, percentages and decimals can be hard to understand, but these reversible magnetic piec..
Learning to count and add/subtract is one of the first things children will do when they enter sc..
Geomag Mechanics Classic is a 33 piece magnetic construction set consisting of magnetic rods, non-m.. The Geomag™ Panels add a highly innovative element to the original Geomag™ concept. Geomag™ Panels ..
Saying 'well done' to your child is the very best way to promote positive behaviour. Keeping a rewa..
Michael Meister has illustrated a time travelling guy and given you lots of costumes to prepare h.. 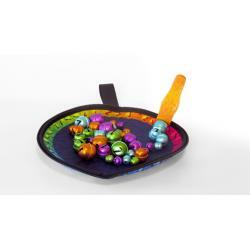 The fun way for children to learn about how magnets work!Select one of 40 pattern matching challenge.. These foam Freaky Flier planes encourage creative play! Challenge your friends to see who can fly t..
Have fun anywhere with the extensive and compact T.S. Shure Alphabet and Numbers Magnetic Tin Play ..
Storytelling and creative play are easy with this beautifully illustrated magnet sets — Hot Rods. S..